I am so glad it is the beginning of Strawberry season. Strawberries are so fun and delicious. They are low in calories and are an excellent source of vitamin C. This week’s recipe features this berry delicious fruit in a nutritious whole grain muffin. Your family will not even know that they are eating something so good for them! Preheat oven to 400 degrees. Line muffin pan with paper liners or spray with nonstick cooking spray. In a large bowl, combine yogurt, applesauce, milk and eggs; blend well. In medium bowl, combine flours, brown sugar, granola, wheat germ, oat bran, baking soda and salt. Stir dry ingredients into wet ingredients just until moistened. Fold in strawberries. Fill each muffin cup about three-fourths full. 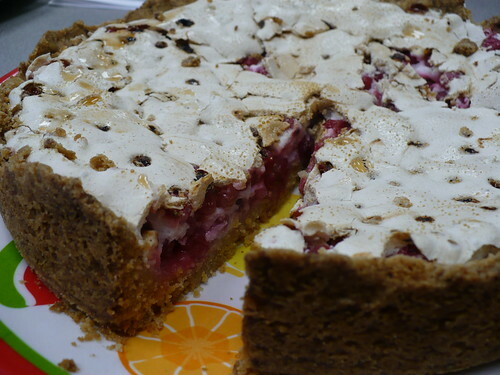 Bake for 20 minutes, until golden brown or until a wooden pick inserted into center come out clean. Nutrition Information: 166 calories, 5 g protein, 34g carb, 3 g fiber, 2 g fat, 36 g chol, 108 pg folate, 2 mg iron, 459 sodium. Herb Day is tomorrow, so come on out and buy your herbs for the summer, eat some good food, and attend seminars on herbs and pollinators. 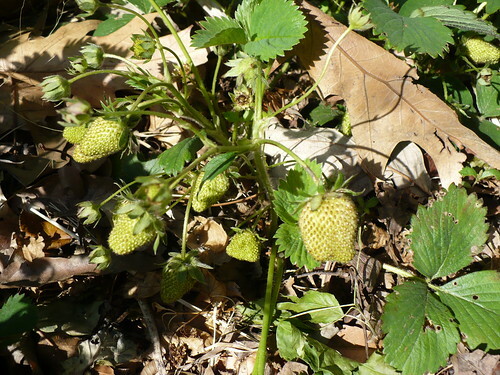 I continue t be amazed by how many strawberries are on the plants this spring. I almost think the plants might have too many berries. We’ll have to make sure to give them a little fertilizer in mid-summer when the fruiting slows down. 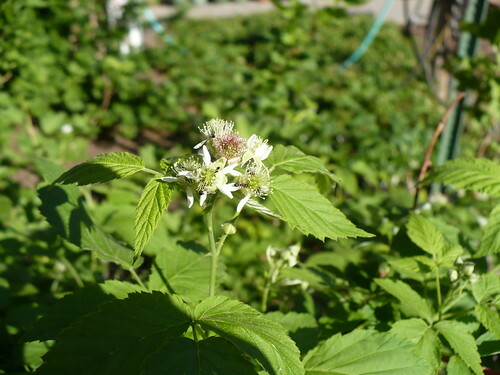 The black raspberries are also in the process of blooming. It is really easy to miss the fact that they’re blooming, because the flowers aren’t all that big and showy. They are even smaller than red raspberry flowers. Of course, the fruit tend to be smaller too. 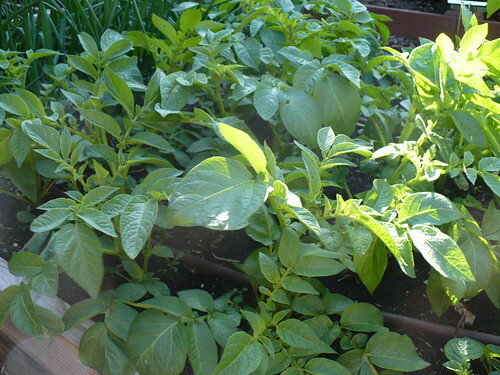 The potatoes in the Family of 4 Garden are growing quite rapidly. It’s not quite a potato jungle yet, but I think it could get there by the time they are full grown. 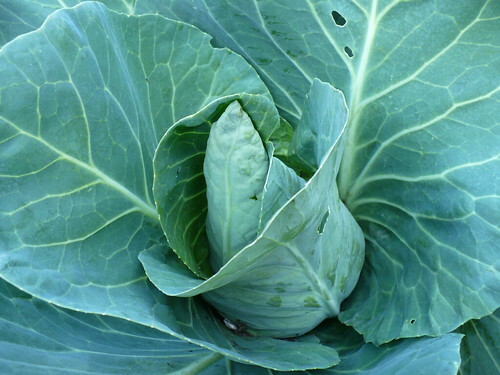 I know I’ve posted at least one cabbage picture every week now, but the blue-green leaves are so pretty and the pointed heads are just too cool. The grafted tomatoes are finally big enough that the clips are starting to come off. 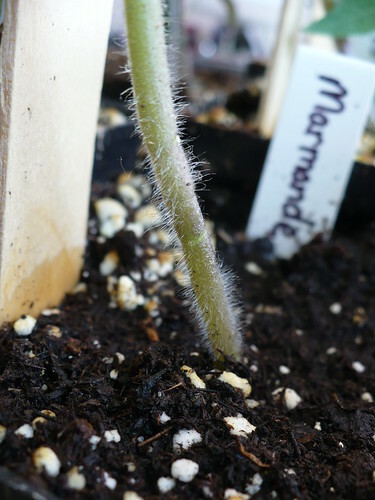 Can you tell where this plant was grafted? I’m not sure you would notice if you didn’t know to look for it. 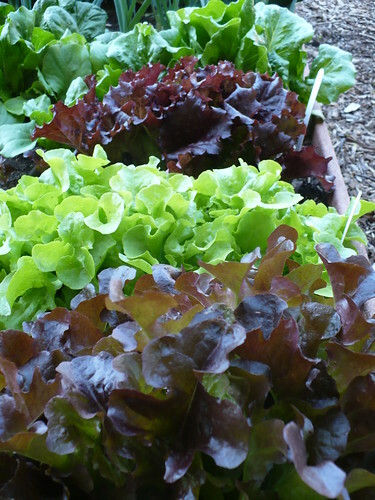 These four lettuces are looking great. I really like the contrast of colors and textures. 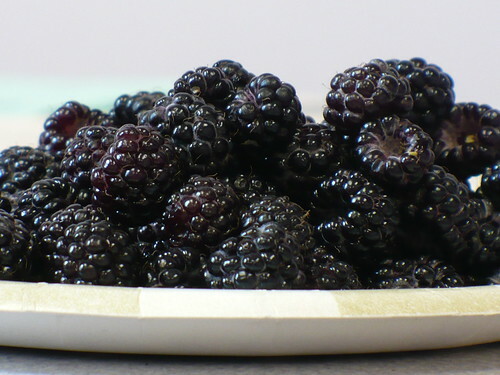 We are late getting our berries pruned this year, because I wanted to use them for the workshop last Saturday. 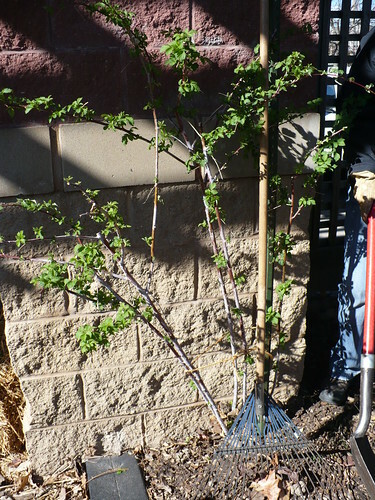 I pruned most of the raspberries on Saturday, but we still had to do some cleanup and then prune up the currants and gooseberries. Yeah, I can’t wait for summer either! It was definitely vigorous last year, and we had to prune out lots of canes that were trying to root themselves all over the place. 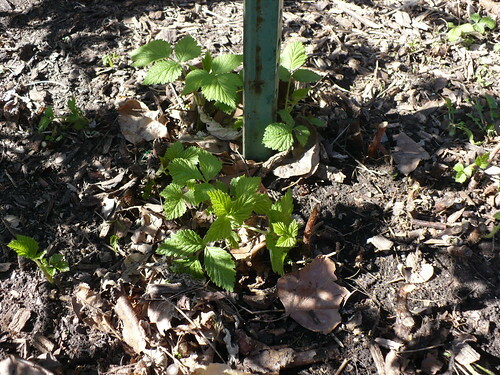 We pruned out all of the old, diseased red raspberry canes, leaving just these new shoots to become this year’s primocanes. Because of the problems last year, if we see any signs of disease this year on these berries, I think we will remove the plants. 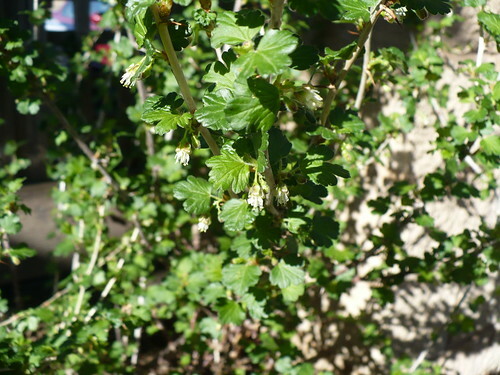 Fun Fact: Studying the timing of when certain plants bloom, etc from year to year is called phenology.